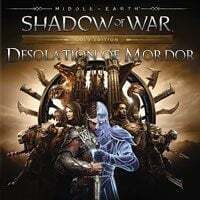 The DLC to Middle-earth: Shadow of War, in which the player assumes the role of Baranor - the commander of Minas Ithil who faces the threat coming from the East. This is Middle-earth: Shadow of War expansion pack. Desolation of Mordor is another expansion to Middle-earth: Shadow of War developed by Monolith Productions. Similarly to the base game, this add-on is available on several platforms, including PC, PS4 and XONE. The previous expansion called Blade of Galadriel allowed players to control Eltariel, known from the base game. Middle-earth: Shadow of War – Desolation of Mordor gives players at their disposal an entirely new protagonist. The storyline of this DLC revolves around Baranor – the commander of Minas Ithil who is tasked with gathering an army and dealing with the threat coming from the East. The most important element of this expansion to Middle-earth: Shadow of War is the new desert region of Lithlad that players can freely explore. Moreover, this add-on offers the option to recruit human mercenaries, with whom you can conquer consecutive sunburnt territories – one should remember that unlike Talion, Baranor does not use the Ring of Power and thus cannot possess the beaten orcs. In combat, the protagonist utilizes new pieces of gear crafted and upgraded by Torvin (a dwarf hunter) via a crafting system. Similarly to the previous expansion, players who purchase the Desolation of Mordor can complete the main story introduced by the base game as the main protagonist of the DLC – in this case, it is Baranor. Middle-earth: Shadow of War – Desolation of Mordor is not a standalone expansion, thus it requires you to own the base game. This add-on is available to purchase separately, or as a part of the season pass.